Some brown birds commonly confused with male or female House Sparrows include: American Tree Sparrow, Carolina Wren, Cassin's Finch, Chipping Sparrow, Cowbird, House Wren, Eurasian Tree Sparrow, Harris's Sparrow, House Finch, Purple Finch, Rose-breasted Grosbeak (female), Junco, Song Sparrow, White-crowned Sparrow, White-throated Sparrow, and even a Black-capped Chickadee. 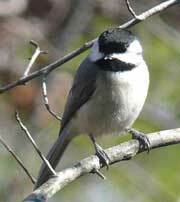 See neat online bird identification guide. Be aware that plumage is variable (by location, female, immature), so pay attention to the shape and color of the bill, behavior, vocalizations, eye rings, etc. Don't rely on size if other birds aren't nearby for comparison. Don't try to ID birds in a trap when they are wet (e.g., from rain) - let them dry off first. The Sibley Guide to Birds is my favorite Bird ID book, but many other good ones are available. 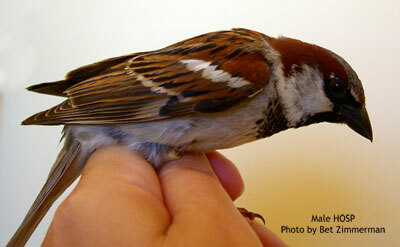 Male House Sparrow (HOSP): black, v-shaped bib on the breast under the beak (darkest during breeding season, lacking in juveniles), grayish-brown feathers with a white horizontal bar on the wing and some black streaks, and GRAY cap on the top of their head with chestnut below (not a chestnut cap like the chipping sparrow.) Small white eye patch over eye (not present on Eurasian Tree Sparrow). See more photos. The song is an boisterous, non-musical, monotonous single-note chirp, often heard in the garden section of stores like Home Depot or around restaurants or outdoor cafes. Female HOSP: dull gray with a light streak at and behind the eye. The breast looks a little streaked in this photo but it's not very visible in real life. Female HOSP, photos by Dave Kinneer. Notice yellow at base of beak, and pinkish feet. Color on this photo is more accurate than the one above. 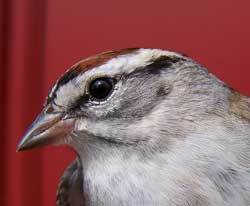 Chipping Sparrow: smaller, mature adults during breeding season have a chestnut cap, distinctive, strong dark eye line. Often mistaken for HOSP, but much smaller. May occasionally perch on a nestbox, but nest in trees. Photo to the left by Wendell Long. 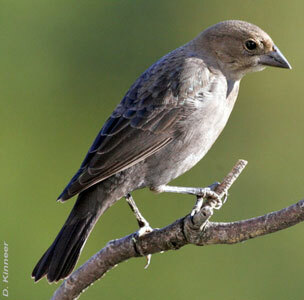 Brown-headed cowbird (female): larger, legs are gray-black (not pinkish like a House Sparrow), with fine streaks on breast. Photo on left by Dave Kinneer. Photo below by Zimmerman. 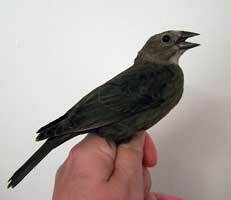 See more info on cowbirds. 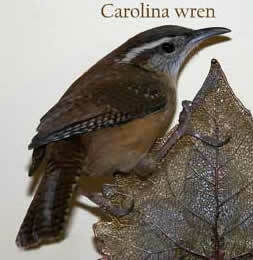 Carolina Wren: smaller, long pointy beak, white stripe over eye, buffy orange belly, tail often held upright. Will also use a nestbox. Photo by Zimmerman. 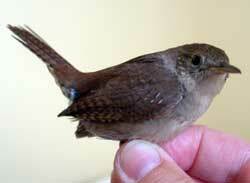 House Wren: smaller, long pointy beak, tail often held upright. Drab gray brown belly. Will also use a nestbox. Photo by Zimmerman. 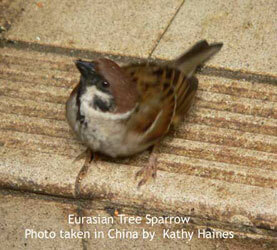 Eurasian Tree Sparrow: brown crown instead of the HOSPs' gray crown, and a black spot on its cheek that the HOSP doesn't have. Not as chunky or big headed as HOSP. Male and female look the same. ALSO NON-NATIVE. Will use a nestbox, slightly smaller and more trim than a HOSP (entrance hole of 1.142 inches to exclude HOSP.) Protected in some states (e.g., parts of IL.) Photo by Kathy Haines. Black-capped Chickadee (left) or Carolina Chickadee (right): This bird is not brown (it's gray and white), but does have black under its beak. It is a cavity nester. It is smaller than a HOSP, and has a tiny beak. Believe it or not, someone actually shot a pair attempting to nest in a box, believing they were House Sparrows. Will use a nestbox. BCCH Photo by Wendell Long and CACH Photo from Wikimedia Commons. 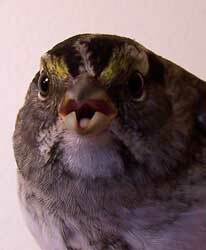 White-throated Sparrow: Similar in size to HOSP and back looks similar, but note yellow lore between eye and bill, and prominent stripes on head. 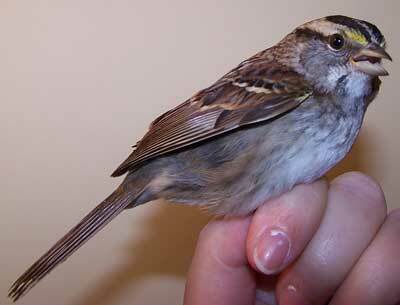 Some White-throated sparrows have bright white stripes on the head and throat. Photo by Zimmerman. Harris's Sparrow: male has a black bib, but the head is black, it has a PINK bill, and it is about 1" larger than a HOSP, with a longer tail. 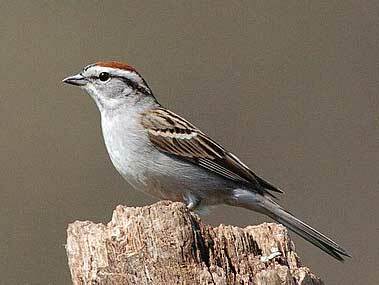 American Tree Sparrow. Occasionally caught in a ground trap. 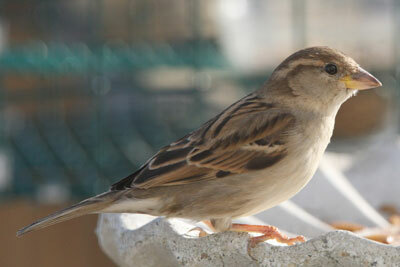 Large sparrow (approximately 6 inches long) with a long tail and a rufous cap. This sparrow has a dark spot in the center of their breast, and frosty edges to their wings and tail, with a chestnut "j-hook" by the wing, and a little heart spot on the chest. The crown is rufous, as is the stripe running behind the eye; the patches above the eye, cheeks, throat, and nape are gray. The upper mandible, legs, and feet are dark, whereas the lower mandible is yellow. 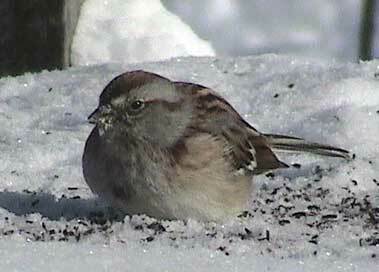 (From The Great Backyard Bird Count, Tricky Winter Sparrow ID). Photo by John Beaudette. 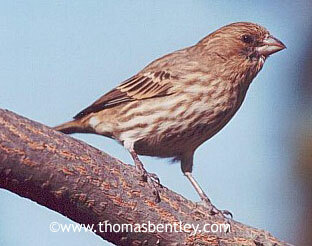 Male House Finch: Notice streaks on breast. 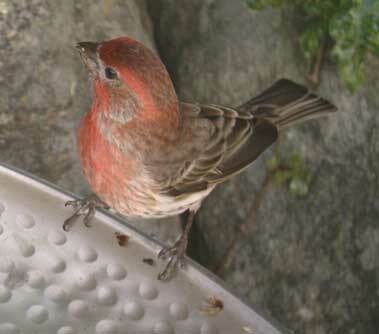 Info from Andrea Wuenschel: to distinguish from a male Purple Finch: the bill is very short and curved, the mask is brown (Purple Finches have a rosy wash over the whole head), and the wing is brown (Purple Finches again have a rosy wash over the wing as well); also the color on this bird is much too orangey-red for a Purple Finch. Photo on left of female House Finch by Dave Kinneer. 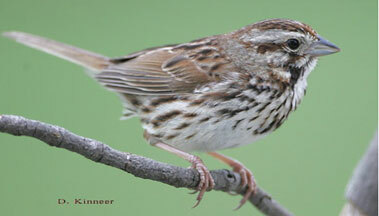 Song Sparrow: There are variations (Eastern, Southwest, California Coast, Aleutian, Pacific Northwest), but all have a coarsely streaked breast. 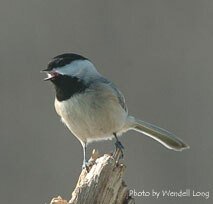 Does not use a nestbox, occasionally caught in ground traps, especially when cracked corn is used as bait. Photo at left by Dave Kinneer. 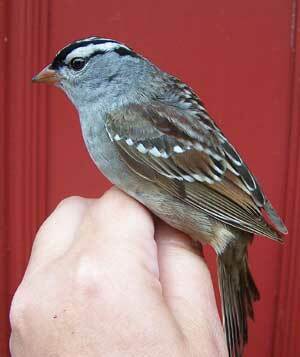 White-crowned Sparrow: Immature birds can be very difficult to distinguish from female HOSP. 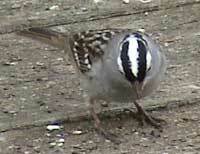 They do have the extra dull stripe on top and one extra wingband stripe, a breast that is more gray. Photos on left by Bet Zimmerman, above by John Beaudette. Cassin's Finch: Female has streaked breast. Large head often appears peaked. Males has bright red crown. Wings and beak are similar to HOSP. Female Rose-breasted Grosbeak: Someone once asked me if this was a HOSP on steroids. 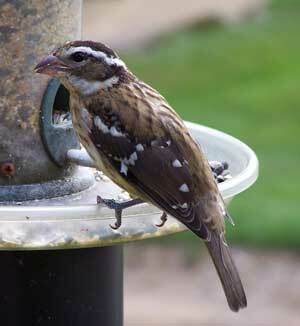 A female Rose-breasted Grosbeak is about twice as large as a House Sparrow, and has a streaked whitish breast. Notice boldly striped head. Watch video clip. Photo by Zimmerman. Slate-colored Junco: Mostly gray, but sometimes brown adult females. Occasionally caught in a ground trap. Distinctive tail - in flight it fans out and white is visible on outside feathers. Not a cavity nester. Only seen in CT in late fall and winter. Photo by John Beaudette. The House Sparrow is a persistent enemy of many native birds, especially those which frequent the neighborhood of houses, or which nest in boxes, holes or other places prepared for them by their human friends.